“Mapping” need not be restricted just to maps. It can extend to describing, contextualing, situating. 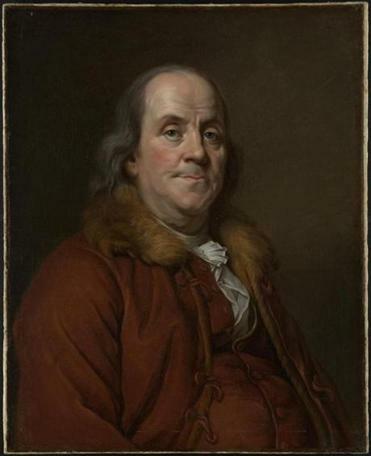 Hence “We Are One: Mapping America’s Road from Revolution to Independence” does not limit itself to cartography, even if more than half of the 100 or so items on display are maps. The show runs through Nov. 29 at the Boston Public Library. Note that although the show is presented by the library’s Norman B. Leventhal Map Center it’s not in the center, which is located at the back of the BPL’s McKim building. Rather, it’s in the McKim Exhibition Hall, in the front of the building. Even with so many maps on hand, it never hurts to get directions. “We Are One” also includes books, currency (both banknotes and coins), a ship model, and two teapots. One of them belonged to Crispus Attucks, the African-American who was killed in the Boston Massacre. 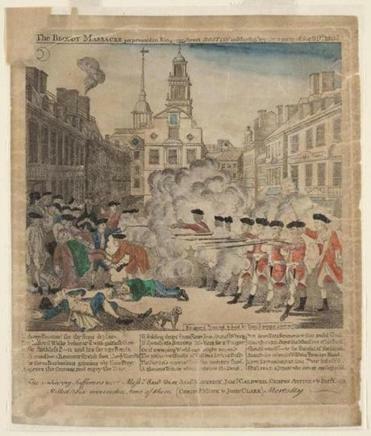 The show also displays Paul Revere’s famous print of the massacre, as well as paintings, documents, a sword, a pistol, powderhorns (one of which has a map of Boston engraved on it), and a gorget that belonged to George Washington. A gorget? It’s a piece of ornamental armor worn around the throat. That’s the casually didactic fashion in which “We Are One” works: Looking at this, we learn about that. A 1750 survey map executed by a young Washington, for example, tells us as much about him and his abilities as it does about contemporary map-making or the land he was surveying. The story the show has to tell is familiar, of course — the passage from 13 separate British colonies to one independent nation. That passage involved battles with French and Indians, protests and conflict with the British authorities, a protracted and ultimately successful war with those authorities, and, finally, nationhood. 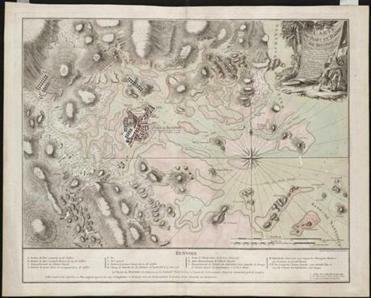 Jean de Beaurain’s 1776 map of Boston Harbor. Yet it’s in the nature of familiar stories to get taken granted, with facts overlooked, forgotten, misunderstood, or not known in the first place. So even if “We Are One” didn’t include so many distinctive items (note the particularly handsome 1776 engraving of Charleston, S.C.), it would still have useful lessons to offer.